The LGBT+ community and their allies gathered to protest the 'gay purge' currently taking place in Chechnya. News 4 February, 2019 . Written by Peter Dunne. Representatives from LGBT+ and human rights organisations, along with their allies, gathered this evening outside the Russian Embassy to protest the horrific abuses perpetrated against the queer community in Chechnya. With detailed and confirmed reports of sexual assault, torture, detention and murder against those perceived to be members of the LGBT+ community, the protest was organised to demand that both the Irish and Russian governments intervene. 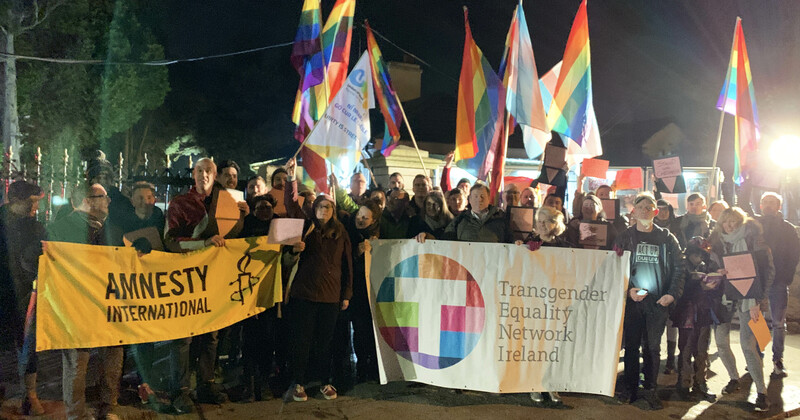 The group gathered included representatives from GCN, LGBT Ireland, Dublin Pride, USI, TENI, Amnesty International, ACT UP, Queer Diaspora Ireland and Free Legal Advice Centres, Senator Fintan Warfield and concerned members and friends of the LGBT+ community. They held aloft rainbow flags and posters and banners proclaiming both solidarity with our Chechen friends and anger at the inaction of both the Russian and Irish governments. The Irish LGBT+ community stands in solidarity with our LGBT+ family in Chechnya. We condemn the escalating violence against LGBT+ people and urge An Taoiseach, Leo Varadkar, to publicly condemn the anti-LGBT+ crackdown. The Irish Government must raise this issue at the highest possible level with Russian leaders and call for an immediate end to this harrowing persecution. The Irish government needs to live up to its international protection obligations to recognise and protect Chechen refugees who reach Ireland, as well as using its full consular influence, facilities and resources to support The Russian LGBT+ Network in its vital work in Russia and the region at this time in affording safe options to those at risk. The Irish LGBT+ community will not let this matter rest or fall out of the news cycle. We will continue to stand with the LGBT+ community in Chechnya and demand that the Russian authorities put an end to the violence and bring those responsible to justice. Another of the speakers, Collette O’Regan from LGBT Ireland, later told GCN: “It’s incredibly important that we are outside the Russian Embassy tonight because it sends a message to Russia and to our own government and to the general public that human rights need to be protected everywhere in the world. Senator Fintan Warfield from Sinn Féin told GCN: “Russia must make sure that the persecutions and the human rights abuses in the Chechen Republic are fully investigated and that they are ended immediately and that LGBT people who require assistance are given assistance. This is just the beginning of the battle to end human rights abuses in Chechnya and the community pledges its continued solidarity to our LGBT+ family around the world. 4 February, 2019 . Written by Peter Dunne.